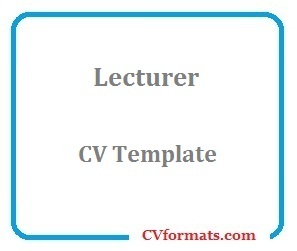 Mentioned is the way you can write Lecturer Cv Template. People looking for jobs can easily download these Lecturer Cv Template in word or pdf format or just view it online to copy and paste. Cover letter of Lecturer Cv Template is also available. Just change the name , address , qualification and experience and your Lecturer Cv Template is ready. One Year Diploma in Computer Hardware and Software (DCHS) from National Institute of Science and Technical Education (NISTE), Lahore. Three Months Graphic Designing and Desktop Publishing course with Prince Salman College of Professional Education, Sultana Foundation, Lahore.  1 Years experience of Teaching as Senior Science Teacher in Muslim International High School, Rawalpindi.  1 year experience as Assistant Lecturer (Maths) in Prince Salman College of Science, Sultana Foundation, Lahore.  Net Browsing and Internet.  Fluent in English, Urdu & Punjabi.  Effectively work in group & team.  Ability to work independently.  Ability to grasp things efficiently.  Regular, punctual, dedicated, honest, hard working and willing to accept responsibilities.  Proficient in using MS-Office.  Working knowledge of Internet using.